A little drinking song that first appears in the tragic play “Rollo, Duke of Normandy – or, The Bloody Brother“. This was written in 1617 by the playwright John Fletcher (1579 – 1625) but while most scholars agree that it was originally by Fletcher, by the time of his death associates of his, namely Philip Massinger, Ben Jonson, and George Chapman, had expanded it around 1627/30 and then published it in 1639. 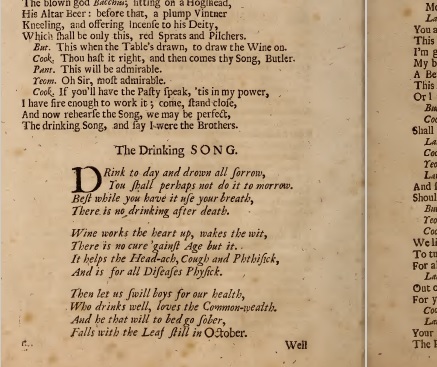 The drinking song in Act 2, scene 2 is known to have come from Fletcher’s original script and therefore he is considered the author of the song, although Ben Johnson is quite frequently given the credit. I have tried very hard to find a score or melody for the song – all too often “songbooks” and plays with songs in them do not provide the melody in conjunction and one must rely upon a surviving score typically jealously guarded by playhouse troupes. There is a classically scored version of this song that is far too lofty and weighty to have been appropriate for what the song is and was used for… I finally gave up and composed a melody in the style of some from the era. One can easily see the inspiration for a song to come later – Landlord Fill The Flowing Bowl, which originates from later in the 17th century. There’ll be no drinking after death. ** Tisic is an obsolete colloquial term for consumption, or tuberculosis. *** Physic is simply another term for medicine. Text from “Rollo, Duke of Normandy”, Act 2, scene 2.